A great embroidery and sewing machine. That says all. 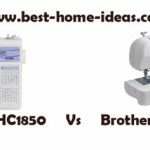 Definitely the best among budget embroidery machines available in U.S. 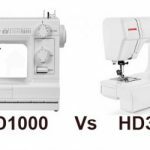 Brother SE400 tops the list of best embroidery machines available under $600. It is a fully computerized machine. It combines sewing and embroidery. It is an all-rounder. 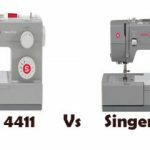 It comes with 120 frame pattern combinations, 5 alphabetic fonts, 70 built-in embroidery designs, 67 built-in sewing stitches and 98 stitch functions. The included frame is 5 x 7. The machine has 4 inch x 4 inch embroidery capabilities. It comes with an embroidery foot and a full spool of bobbin thread. Extra large bobbins are also included. There is an automatic thread cutter as well. You can use the reverse button for reinforcing. The handle on the top adds to the portability of the machine. The quick reference book you get with Brother SE400 has a lot of information such as what color to use, threads etc. The instruction booklet will also tell you the time required to finish a design. The manual is easy to read and understand. 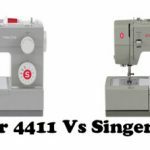 One great thing about Brother SE400 is that you can download special designs from iBroidery.com and import them via USB. It is very easy to import designs. You will get a lot of free design patterns as well. It also has a slot for embroidery cards. It supports only two types of embroidery files namely .pes and .pen. You really don’t need your foot controller to operate Brother SE400. You can easily control sewing speed with push buttons and the Start/Stop switch. While doing embroidery, you must use embroidery needles, others are not recommended. The work light LEDs do a decent job of illuminating the work space. It is a beautiful machine when turned on, with all those lights. You can easily insert the embroidery unit on to the machine. But before inserting the unit, make sure that the feed dogs are down. Another good feature of Brother SE400 is that the threading system is extremely easy. You just need to follow the numbers on the machine and the automatic needle threader will thread the needle for you. It is very easy to attach the embroidery hoop on to the embroidery unit. I think Brother has done a very good job in making things simple with such a complicated embroidery machine. Selecting the patterns is made easy with the back lit LCD screen. The machine will also suggest thread color for you, when you select a particular pattern. You can adjust the pattern further in the layout settings. You can change the size of patterns in the size menu.There is no limit for customization on Brother SE400. The start button will remain red until all the settings are correct. If everything is right the button will turn green and you are ready to go. 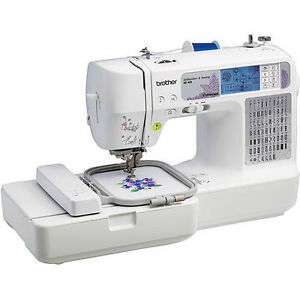 Brother SE400 works like a charm while sewing multiple layers of fabrics. You can easily do mirror designs or rotate the design to different angles say 90 degrees, 10 degrees etc. The power cord looks a little bit flimsy. It comes with a medium hoop only, you will require a large embroidery hoop for sure. So you will have to buy it separately. There is no case as well. 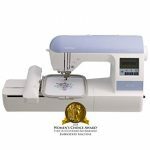 If you sew, quilt and do embroidery, then this machine is one to consider. It is very nicely priced as well. Overall, Brother SE400 is a great choice for those who want to start out on their embroidery projects.